Ok, now lets crack on…. 3. Sort out notes from critique of But Not Forgotten. Ha ha ha, what notes? I didn’t make any! 4. Read next Faber critique piece. Done! 5. Continue with Richard Skinners book. Done! 1. Print out Sorrento Sunrise and file (for editing at a later date). 2. Finish BN’s manuscript – Beta reading. 4. Do a review of Richard Skinners book and Start Nigel Watts one! 5. Continue making notes on new version of But Not Forgotten. Need to decide on POV etc. if it goes well, make a start! 6. Print off and file Nano short stories. 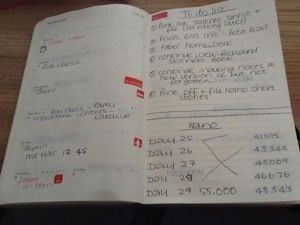 This entry was tagged Faber, Goals, Nano, postaday, Richard Skinner, To Do List, Writer, Writing, Writing Goals. Bookmark the permalink. I ordered them on line, parted with my money, and they took over a week to get here! The company I use is usually pretty good (48hrs normally) so I don’t really know what the problem was. I just wish I’d gone to a shop now! yesh we’re going to Nottingham which is colder than here (Ontario canada) circumstances dictated the date we go. Hm. My list. Come up with 5-10k words for this story I’m in the middle of by Friday so I can beg people to do a read through for me. Did I mention I haven’t actually finished my NaNo story? So that. Do my part in the fiction relay I’m in. Oh and grade papers because its finals week and grades will be due. Good luck to you, ma’am. Thanks honey, and good luck to you! Put together my two nano’s of Grand Girls Holiday so I can then read it and fill in the gaps and finish it. Me again – I found out how to do it ALL BY MYSELF! I am feeling very proud… There is now a ‘follow by email’ box! I joined a challenge to write 1 story every week this year. Due to the wedding and stuff I thought I’d get nowhere near, but I’m actually closer than I thought so I’m going to write as many more as I can and try to catch up by New Year’s Eve. Still editing, still proof reading – and still waiting to hear from the agent. Grrrrrr. I thought you were going to e mail her Maddie? It really is taking the mickey! Do you know she definitely got it? I think you should phone her Maddie! HUNT DOWN … DARN TYPOS !! hey I figured out what that meant–glad I solicited such a response!